Japanese Episode AG 087: "Shinpi! Uchuu kara Kita Pokemon!?" American Episode 359: "Crazy as a Lunatone"
One night, a comet can be seen streaking through the sky toward a small town. The meteorite lands as Ken and Mary, the two members of the PFC, arrive at the crater created by the shooting star. 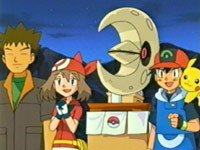 The two are excited to see a Lunatone come out of the rock and attempt to capture the pokemon, but it is able to get away. Later, Satoshi and his friends stop by Valley Town on their way to Minamo City. There, they notice that everyone in the town is acting strange, as if they are possessed by something. Satoshi-tachi decide to sneak around the Pokemon Center in order to find out what's wrong, but they bump into the Rocket-Dan instead! Both groups stumble across Lunatone, who, according to Nyasu, started controlling the minds of the townspeople because it was scared. Lunatone is weakened now and needs to be placed under a full moon in order to regain its energy, so Satoshi and his friends decide to help. According to Joi, who has broken free of Lunatone's spell, a full moon is scheduled for that night! 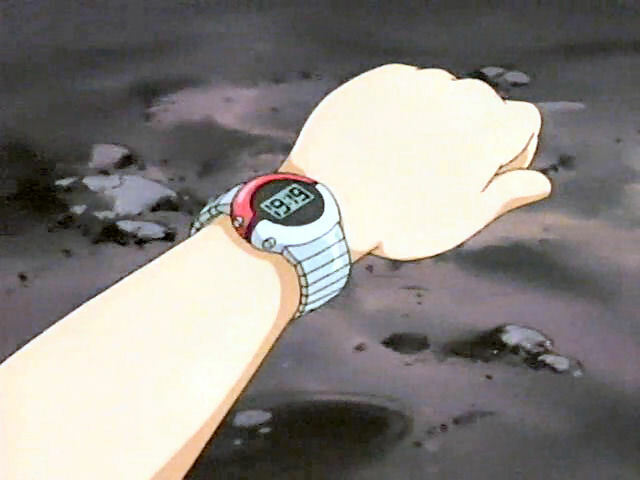 However, because of the unique landscape surrounding the town, the moon cannot be viewed from the streets, meaning Satoshi-tachi will have to transport the Lunatone to a place called Bakuuda Hill if they want to expose it to the moonlight. The gang carries the pokemon, evading the PFC along the way, all the way to the hill. Suddenly, the Rocket-Dan attack! The PFC also arrives and sends the Rocket-Dan blasting off before setting their sights on Lunatone. Fortunately, Lunatone has absorbed enough of the moon's rays to regain its strength and wastes no time in sending the PFC blasting off. Now that Lunatone is better, Valley Town can return to normal, and so our heroes resume their journey to Minamo City. Well, this episode was pretty so-so. I mean, it started off well enough, but then it just went into the cookie cutter "let's help a random pokemon for no reason" plot that this show reuses over and over again. There were some great parts - the PFC and their Game Boy Advance SP, their mistaken capture of Hasubrero, Satoshi-tachi running away from Joi, the fact that Takeshi has a picture of the tanned Joi from the Orange Islands for no reason - but the rest was just meh. Lunatone has a different voice in the dub as it does in the Japanese version. You win some, you lose some. 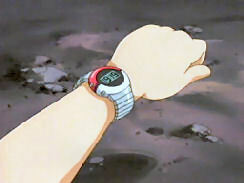 Then, after the episode's title screen, a second is cut from the shot of the valley. Basically, 4Kids changed 19:19 (7:19pm) into 11:54pm. Now the best reason I can come up for this change is because the Japanese version shows a 24-hour clock, and 4Kids thought that American kids wouldn't be able to handle that. The thing is, the times aren't equivalent, and the time in the dubbed version doesn't make any sense when you consider that the moon rises way before midnight in most places in the world. The 7:19pm in the Japanese version is much more realistic.